Unsettled Climate | We feel that climate science is, in the current situation, too important to be kept under wraps. 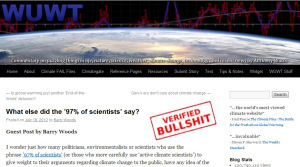 This is a guest post by Prof. Richard Betts, Head of Climate Impacts at the Met Office, (IPCC AR4 and AR5 lead author) about Lewandowsky, Oreskes et al’s forthcoming paper, which suggests that climate skeptics influence climate scientists. I think it highlights a difference of opinion how science should be communicated to the public. Stephan Lewandowsky and co-authors have published an Executive Summary oftheir forthcoming paper* Seepage: Climate change denial and its effect on the scientific community. The authors suggest that climate scientists are allowing themselves to be influenced by “contrarian memes” and give too much attention to uncertainty in climate science. They express concern that this would invite inaction in addressing anthropogenic climate change. It’s an intriguing paper, not least because of what it reveals about the authors’ framing of the climate change discourse (they use a clear “us vs. them” framing), their assumptions about the aims and scope of climate science, and their awareness of past research. However, the authors seem unable to offer any real evidence to support their speculation, and I think their conclusions are incorrect. As their example of scientists apparently giving undue weight to “contrarian memes”, Lewandowsky et al focus on what they describe as the “asymmetry of the scientific response to the so-called Œpause’”. They assert that “on previous occasions when decadal warming was particularly rapid, the scientific community did not give short-term climate variability the attention it has recently received”. They do not specifically identify the “previous occasions when decadal warming was particularly rapid”, but it’s fair to assume that they are referring to the 1990s, probably the period 1992-1998. This was the most recent occasion when global mean temperatures rose rapidly for a few years, and previous such occasions occurred before climate science had become established as a widely-established field of research. This assertion, however, is incorrect. Short-term climate variability did receive a lot of attention in the 1990s ­ see extensive discussion in the first 3 IPCC Assessment Reports, and brief discussion by Hawkins et al (Nature Climate Change, 2014). One specific example of a high-profile paper on this topic is Sutton & Allen (Nature, 1997), but there are others. It is perplexing that Lewandowsky et al do not seem to be aware of this research on short-term climate variability. One explanation may be that there is more effective communication of research. Social media opens up many more channels through which climate scientists can communicate their work, instead of this communication being done by middle-men in the mainstream media or vested-interest organisations such as NGOs as in the 1990s. Those outside of the climate science community are therefore much more likely to be exposed to topics that are of interest to the scientists themselves, rather than just topics which interest newspaper editors or environmental campaigners. Possibly Lewandowsky et al are wondering why there was not a raft of papers specifically focussing on the observed temperature record between 1992 and 1998. The reason is simple ­ this was not a particularly surprising event. When global temperatures rose rapidly few a few years after 1992, this was very easily explained by the tailing-off of the short-term cooling influence of the Mount Pinatubo eruption. This had cooled the Earth briefly by injecting large quantities of ash into the stratosphere. Indeed this cooling had been successfully predicted by Jim Hansen using a climate model shortly after the eruption. A few years later, 1998 was an exceptionally warm year globally because of a major El Nino event. The fact that these two events were well understood and even partly predicted in advance meant that there was less of a puzzle to be solved, so less motivation for extensive research on the drivers of global temperature over these specific years. In contrast, the trajectory of global temperatures in the last 15 years or so was not specifically predicted in advance. Although global temperatures remain within the envelope of uncertainty implied by multi-model studies, this is not the same as actually predicting it. So this time, there is a interesting puzzle to be investigated. I have not actually counted or systematically reviewed the papers on variability in the 1990s compared to those in more recent years, so although there was a lot of variability research in the 1990s, it is still possible that there are more variability papers in the latter period. However, even if this is the case, there are other reasons for this. Users of climate information (and hence funding bodies) are increasingly interested in adaptation planning, which tends to require information in the nearer-term when natural variability dominates. More recently this has matured into the agenda of Climate Services, which includes forecasting on seasonal, inter annual and decadal timescales. This has led to the development of new scientific capabilities to address this need, eg. very large ensembles of climate models, initialised forecasting (where models use data assimilation to start from actual present-day data rather than pre-industrial), increased resolution, and greater computing power. So in addition to the scientific motivation to study variability which already existed in the 1990s, there is additional motivation coming from stakeholders and funding bodies, and also more extensive capability for this research. Lewandowsky at al regard research into natural variability as “entertaining the possibility that a short period of a reduced rate of warming presents a challenge to the fundamentals of greenhouse warming.” Is there any evidence at all of climate scientists actually thinking this? I don’t think so. This indicates a fundamental misconception about the scope and aims of current climate science – the authors seem to assume that climate science is entirely focussed on anthropogenic climate change, and that natural variability is only researched as a supplementary issue in order to support the conclusions regarding anthropogenic influence. However, the truth is very different ­ natural variability was always of interest to scientists as part of understanding how the climate system works, and Climate Services and the ambitions for short­ term forecasting are now major research drivers. It is true that some papers have also used the observational record to try to understand and constrain key quantities of relevant to anthropogenic change, namely equilibrium climate sensitivity and transient climate response, but this is hardly addressing the “fundamentals of greenhouse warming”, ­it is simply trying to reduce uncertainty in one of the key aspects of it. Such studies certainly do not limit themselves purely to the “pause” period ­ instead, they include it in a much longer longer period of many decades, since this is the timescale of relevance to changes in greenhouse forcing. Exclusion of recent years from such studies would lead to misleading results, so of course the “pause” period is going to be included. So the perceived “asymmetry” can be easily explained purely as an evolution of scientific focus and capability over the last 25 years. Nevertheless, the hypothesis of psychological influences is intriguing. Could it still be happening even though the specific example of increased research on variability can be explained by other factors? Lewandowsky et al suggest three mechanisms by which their proposed “seepage” may occur ­does the evidence support these proposed mechanisms? Here I focus on the situation in the UK, as this is where I am most familiar, and also because this is where a focus on the “pause” is quite common. The first proposed mechanism is dubbed “Stereotype Threat”. The idea is that climate scientists are worried about being stereotyped as “alarmists”, and react by downplaying the threat. I agree that there may be some evidence for this in the IPCC and the global climate science community – for example, although the Fourth Assessment Report (AR4) included projections based on the high-end A1FI scenario, these were performed with the simpler Integrated Assessment Models rather than full, complex General Circulation Models. Moreover, the media focus on the projections sometimes did overlook the A1FI projection of warming up to 6.4C by 2100. (Indeed I was was told by a long-established and respected environment journalist that the media were very much steered away from the A1FI result when AR4 was published in 2007.) This was indeed one of the motivations for my paper “When could global warming reach 4C?” as felt that the A1FI scenario had not received the attention it warranted. However, despite this possible example of reticence by the IPCC, the UK community does not seem to have followed suit. The A1FI scenario was used in the UKCIP02 and UKCP09 climate projections, and a number of high ­profile UK conferences focussed on the higher-end risks of climate change, eg. “Avoiding Dangerous Climate Change” in Exeter in 2005; and “4 Degrees and Beyond”, Oxford, 2009. UK research institutions are leading two major EU-funded consortia on the impacts of “high-end climate change” (I’m coordinating one of these, HELIX, myself). So while talk of the “pause” is commonplace in the UK climate science community, this does not seem to be accompanied by shying away from discussing projections and risks of higher-end climate change. Over the past 25 years, successive UK governments have led the world in supporting climate science and in developing climate policy both at home and internationally. The Conservative Prime Minister Margaret Thatcher personally founded the Met Office Hadley Centre, and at the same time the UK was prominent in establishing the IPCC. For the first 4 IPCC assessment reports, the UK government played a cental role by supporting an IPCC Co-Chair and Technical Support Unit in the Met Office Hadley Centre. The UK has been central to the UN climate negotiations, and under the Labour government of 1997-2010 was the first country to put in place its own legislation on reducing emissions and planning adaptation (the Climate Change Act). In the 2010 election, the Conservative Party manifesto was keen to promote its environmental policies, and prior to the recent election the three main parties signed a statement supporting continuation of the Climate Change Act. Hence, if there is any country in the world where climate scientists can feel that their research is valued by both the public and politicians, it is the UK. The final proposed mechanisms is dubbed the “Third person effect”, and refers to the idea that someone may think that others are more easily persuaded than they are themselves, and react to this. This seems quite plausible, but I fail to see why this would not apply equally to arguments from activists and politicians aiming to persuade people of the threat of climate change. In fact, given the widespread public and political agreement on anthropogenic climate change in the UK, it seems far more likely that the “Third Person Effect” would apply to being persuaded by arguments in favour of acting on climate change than by those against it. So overall I do not see that “seepage of contrarian memes” is necessary to explain research on the recent slowdown in global surface warming, nor do I see any evidence that this is likely to be occurring in the UK climate science community where such research is prominent. There are further intriguing questions arising from the facts that (1) UK scientists discuss the “pause/slowdown”, (2) the UK public acceptance of anthropogenic climate change and (3) successive UK governments have been, and remain, world-leaders in climate policy. If climate scientists have indeed allowed themselves to be influenced by “contrarians”, it would appear that this has not prevented widespread acceptance of anthropogenic climate change or the development and implementation of climate policy. 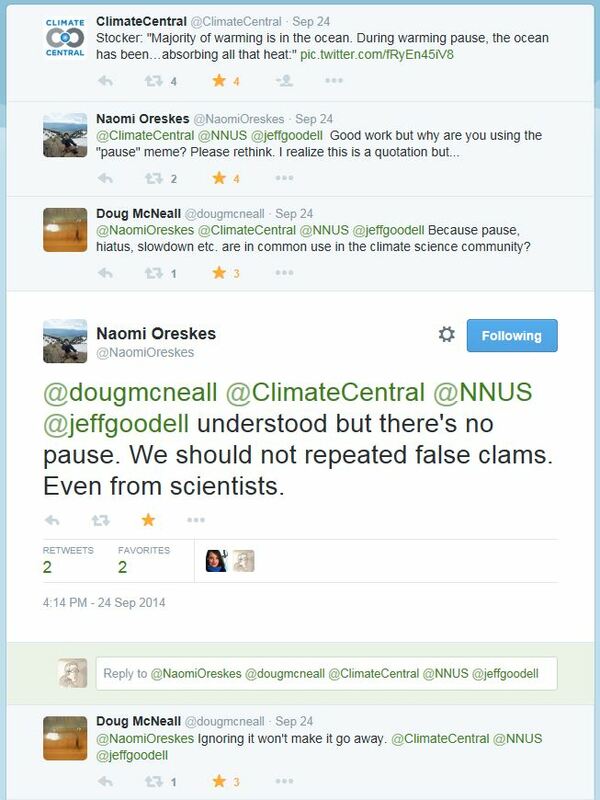 Indeed, if scientific discussion of the “pause/slowdown” is indeed seen by the public and politicians as considering a “contrarian meme”, could it actually be the case that a clear willingness to consider a range of viewpoints could actually enhance the credibility of climate scientists? Therefore could open discussion of the “pause” actually increase the confidence of the public and the government in their advice that climate change is real and man-made? It seems fair to suggest that an intelligent and thoughtful public and politicians would take scientists more seriously if they are seen to be objective ­ indeed some research does support this supposition. So to conclude, I think Lewandowsky et al are incorrect that scientific research and discussion into the recent climate variability has arisen as a result of the “seepage of contrarian memes”. Variability has always been a key topic in climate research, and if this has become more extensive or visible in this recently, it is simply the result of improved science communication, more specific research questions and evolving capabilities within climate science. The evidence also suggests that even if “seepage” is real, at the very least this seepage has had no influence in watering-down UK public opinion and political action compared to other countries – and that possibly the opposite has occurred because the public are more convinced by seeing scientists being objective. *it seems they expected the paper to be published at the same time, but it is not yet available. Stephan offers to send the corrected proofs to anyone who emails him – his contact details can be found here. This gave the impression, to me at least, that a number of scientists really want to talk about the science to the public and others just want to control the message that the public hear. And for me, that the former approach rather trusts the intelligence of the public more, than the latter communications approach of apparently wanting to control the language used publicly by scientists. This is a guest post by Professor Richard Betts, re-posted (with permission of the author) to enable everybody anybody, including myself, who are unable to comment at the other blog, to comment and discuss it here. Here what I think about the D* word(s) – the personal label ‘denier’ and the behaviour descriptor ‘in denial’. I think the phrase ‘being in denial’ can be appropriately applied to a dogmatic insistence* that anthropogenic climate change is not an issue**. [NB see below for definitions before succumbing to knee-jerk reactions!] ‘In denial’ is quite a common phrase in use for other situations, eg. someone who is unable to acknowledge a problem with their health, relationship, business or whatever. A period of being in denial can be quite a natural reaction to very bad news. However, the use of ‘denier’ is different, and the offence and distraction that it causes makes it difficult to use the former phrase now. The reason that ‘in denial’ and ‘denier’ are different is that the former labels the behaviour while the latter labels the person. Most training in education, communications, management, negotiation etc, advises that when dealing with conflict situations, it is important to address difficulties but to focus on what is being done/said and not the person themselves. Labelling the person makes things more emotive and distracts from discussing the real issue. Anyone who’s done teacher training in the UK the last couple of decades will recognise this. The situation is even worse for the label ‘denier’, because it been used by some in connection with holocaust denial, eg.http://www.populartechnology.net/2014/02/skeptics-smeared-as-holocaust-deniers.html. So not only is this making the mistake of giving someone a label as a person, but the label is associated in people’s minds with something horrific. They will understandably find it deeply insulting. If labelling the person rather than the behaviour is poor communications practice, then giving them an extremely insulting label (whether intended or not) is clearly even worse. The trouble is, it’s now hard to go back to just describing behaviour as ‘being in denial’. With things having been taken too far with ‘denier’, this has built an association in public consciousness and makes it more difficult to go back to using language that might actually be more appropriate. ‘Being in denial about anthropogenic climate change’ might well have been OK as a descriptor of certain behaviour if it wasn’t now linked with the offensive name-calling of ‘denier’. *NB I specifically say ‘a dogmatic insistence that anthropogenic climate change is not an issue’ as distinct from questioning whether it is an issue – these are different. Questioning is fine, and indeed this is another reason why both ‘denier’ and ‘denial’ are problematic – they are sometimes very widely applied, to include questioning whether there is an issue and not just insisting that there definitely isn’t. If anyone thinks I am saying they are ‘in denial’, please reflect on whether you are questioning or insisting – if you’re questioning then I don’t have a problem with that, but if you are insisting, then I think you are dismissing large swathes of scientific research. We are not 100% certain that climate change will definitely cause huge negative impacts, but there’s enough reason to think that there is a major risk. **Also, when I say it’s ‘an issue’, I mean it’s something that we probably need to respond to in some way, through some mix of mitigation and adaptation – I’m not pre-judging opinions about the balance of these potential responses, I’m just talking about recognition of the issue. Disclaimer: this is my personal opinion, not necessarily that of the blog host, my employers nor any organisations I am associated with. I had written to Prof Maybery (Head of the School of Psychology) for an academic request for data from Prof. Lewandowsky’s paper – NASA faked the Moon Landings, therefore [climate] science is a hoax. An Anatomy of the Motivated Rejection of Science. …so that I could submit a comment to the journal of Psychological Science. I wrote to Professor Maybery (email below) but instead I received this stunning response from the Vice Chancellor Paul Johnson, (my bold) I have been trying to resolve this very specific issue through the ‘proper channels’ for a considerable length of time now. The observant may have noticed I haven’t blogged for quite a while, nearly a year in fact. This is for a number of reasons (a prime one here) but I have been microblogging, ok, just chatting on twitter, and exploring and commenting at, other blogs on the web. 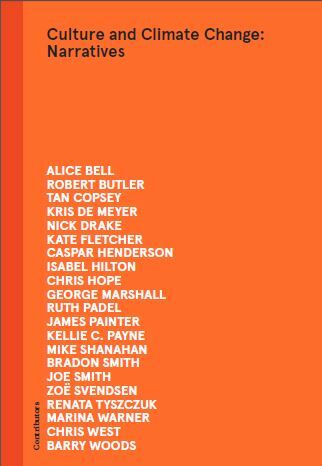 So I’m only back for a brief announcement that I’m appearing at an Open University Workshop on Wednesday 12th February, details below. The next Mediating Change workshop explores how social and other online media platforms such as Twitter, Facebook and blogging have altered the landscape of communication and engagement around climate change science and policy in recent years. They will join media and environment researcher Joe Smith (OU geography, @citizenjoesmith) and director of the Making Science Public programme Brigitte Nerlich (University of Nottingham, @bnehrlich) who will bring their experience to bear on a question that is of relevance to all researchers engaged in complex or contentious issues: How are these now well established media platforms influencing public debates, and how can researchers best make use of them? The workshop will be chaired by Melissa Butcher (OU geography), former radio producer who is currently leading two projects, Hackney as Home (https://twitter.com/hackneyashome) and Creating the ‘New’ Asian Woman.